Enjoy a £10 for ten days trial Club membership instantaneously by subscribing through the App and download a members card to their phone. Members who then decide to take on a full annual membership will be credited their £10 trial. Ability to record visits to redeem rewards for affiliated five star hotel club programme members. Upgrade to affiliated hotel club programmes to enjoy rewards for loyalty. At a glance, view all events at various restaurants and luxury partner offers and gourmet stay breaks. Receive a £20 credit at the restaurant of your choice when recommending a new member who joins the annual membership. 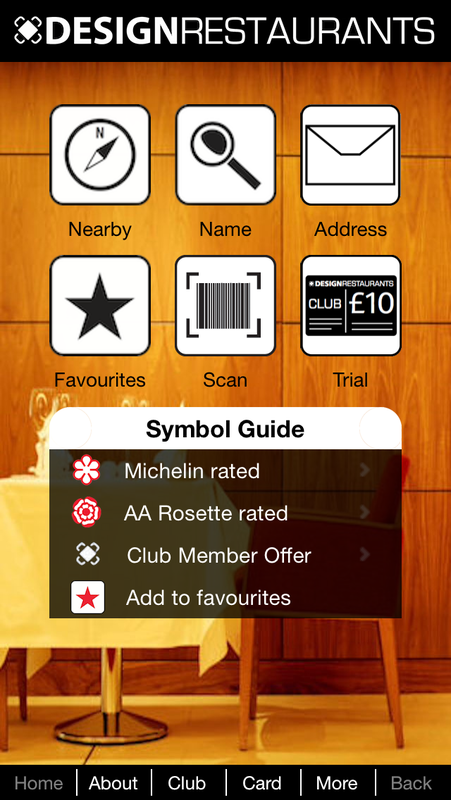 Download the App for free via the Apple App Store searching for ‘Fine Dining by Design Restaurants’ or click this link for Apple users and this link for Android users. For those who have already downloaded make sure you have updated to the latest version (1.8). With inspirational dining at your fingertips, the app is a must have for gourmets and regular diners looking for great places and at great prices. There is simply no other tool in the market with the capability to showcase destination dining venues in this way and an essential place to check out where to go to eat. Look out for the rollout of Design Restaurants iBeacon technology, allowing App users to receive location-specific notifications when passing recommended venues. Updates to Android phones coming soon. For more information about Design Restaurants go to www.designrestaurants.com. Full membership is £90 per year.